Is your ‘Zero Moment of Truth’ impacting your lead conversion success? Shopper behaviour has changed since the digital age dawned. Potential buyers no longer visit stores blind, they go armed with a preferred brand or specific product they’ve researched before stepping inside. Google research found that 84% of all shoppers engage with research before purchase, frequently online, to become more educated in the sector or specific products. 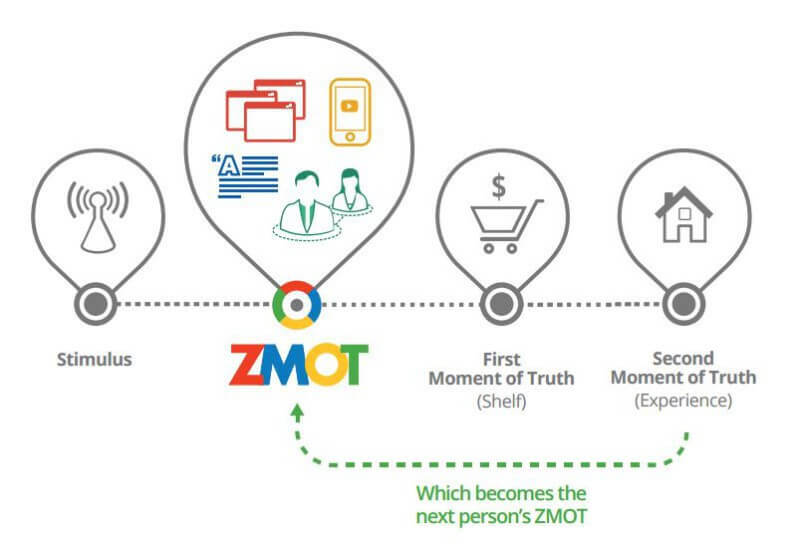 This active buyer behaviour engagement has been named the Zero Moment of Truth (ZMOT) and it has created a new opportunity for how one brand can stand out amongst the rest. The term was coined by Google in 2011 when research found that there was a new step between a stimulus (such as an advert) and the First Moment of Truth (the initial interaction with the brand). A high value purchase such as automotive and technology takes longer and is more considered, as the buyer wants to know they’re investing in something worthwhile. A business looking for a new IT software that will affect the running of the business can’t just go in blind, and in the new age of endless information in your back pocket, the consumer is now the one in the driver’s seat of the purchase journey. Brands have less control over the consumer’s first interaction, but more opportunities to engage with them due to ZMOT. And this has increased the need for a good search and digital presence, to make sure people can find you in the first place. Research conducted by Luth Research found how digital has shaped the customer journey when researching automotive. In a case study the journey included over 900 touchpoints before purchase. In the age where a consumer has access to more and more information about their options, interactions must be approached in an increasingly transparent manner to give a real flavour of what the buyer should expect. Crafting the perfect buyer journey from the initial search engine entry hangs on brand consistency. There are so many touchpoints available for customers to engage with that your brand voice must carry the same values and focus across platforms to reiterate exactly what your brand is offering. The ever-searching audience has brought with it implications. Big brands are working harder and smarter to get their name in the spotlight for potential buyers, through creating content that answers common questions whilst being transparent. Because if they aren’t talking about what’s happening in their sector, the chances are, someone else online will be. How can you focus on the ZMOT? The rise of video and mobile search is continuing to impact the buyer journey as they become more popular forms of marketing. A great example is this from Mercedes-Benz, who created an 18 video playlist on YouTube for their ‘E-Class Sedan’, including a walk around and features video. Some people read peer reviews, some read product specifications, some want to see the product or service in action. So, make sure you’re ticking all those boxes for all the different types of people who are on their path to purchase and giving them the best experience. As buyers research more about a brand than ever before, the push for branded ZMOT interactions could be the difference between a customer picking your brand over your competitor. For more brand insight from A-Z, follow the link below to download our FREE e-book.